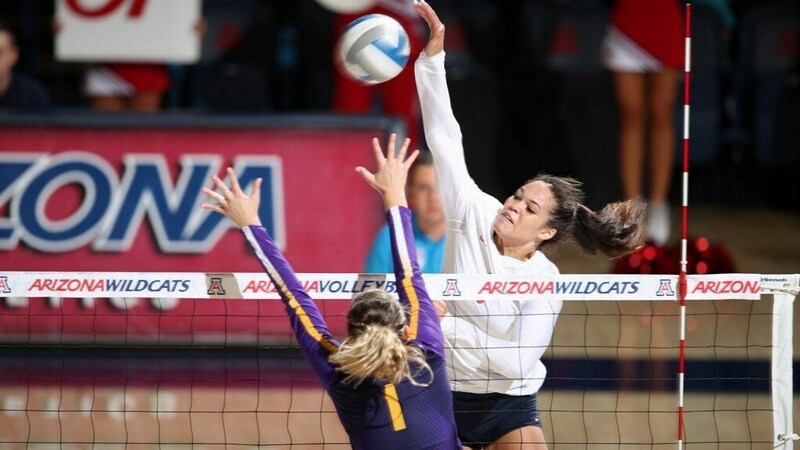 Arizona senior outside hitter Kendra Dahlke is expected to miss 2-4 weeks with a ‘mild foot sprain,’ a spokesperson for the school told VolleyMob on Sunday. Dahlke left late in the team’s 3-1 win over Utah last Sunday. The 6-foot tall hitter from Bonsall, California was the Pac-12 leader in kills coming into the weekend in spite of missing several matches with injury, and remains as such through Saturday’s matches (USC’s Brooke Botkin is 6 kills behind her for that honor, having played 11 more sets than Dahlke). Dahlke missed Arizona’s loss to USC last Sunday after suffering a concussion. This is the latest in a long list of injuries to Arizona’s outside hitters group. Elizabeth Shelton has missed 10-straight matches after suffering a concussion, and Paige Whipple has missed significant time this season with a concussion as well. Whipple had 8 kills in the win over Utah, but hit just .031. Even without Dahlke, the Wildcats swept Oregon State handily on Friday 3-0, hitting .402 as a team. Paige Whipple (18 kills, 5 errors, 37 swings, .351) and Katie Smoot (17 kills, 2 errors, 29 attacks, .517 hitting) led the Wildcats offensively. Oregon State ranks 10th out of 12 teams in the Pac-12 this season in opponents’ hitting percentage. On Sunday, Arizona will have a bigger test against #16 Oregon, though the Ducks haven’t been great defensively either: their opponents have hit almost as well as Oregon State’s, and they rank 9th out of 12 teams in opponents’ hitting percentage this season.